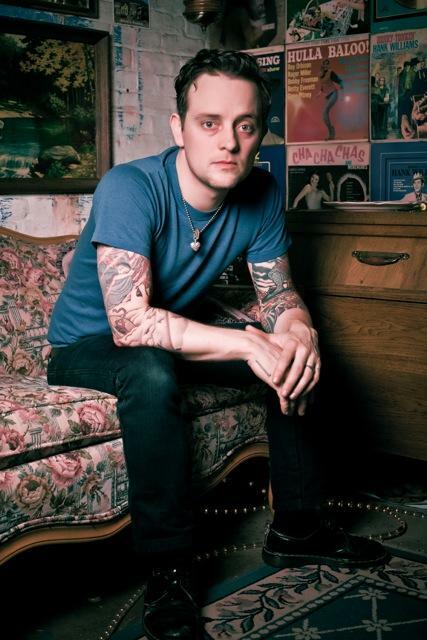 It's been a busy time for the American singer/songwriter Dave Hause over the past year, having to tour with bands like Alkaline Trio, Social Distortion, The Bouncing Souls or The Gaslight Anthem, plus recording his second solo album and joining this year's Revival Tour line up in America. He finished his headline European/UK tour at the beginning of this week before heading to Australia for a number of shows with The Gaslight Anthem. Yes, this is a one hard working musician. Dave has gained some dedicated fans over here and Europe in the last couple of years through his outstanding and memorable live performances and music that strikes through people’s hearts. With a new record and a bigger headline tour coming this autumn, we have a lot to look forward to. I had a pleasure to chat with Dave at the Wedgewood Rooms in Portsmouth, before his third show on the tour (you can read a review of the show here). We talked about touring, upcoming album, song writing, influences and more. Dave even shared a few words of wisdom for the ones who wish to make it in music so read on. EVA: You finished the Revival Tour about two weeks ago and jumped straight onto a plane for the UK/European headline tour. How are you enjoying the tour so far? DAVE: Yeah, everything’s been really great. It’s been really fun to play my own shows. We started in Saarbrucken in Germany, did a couple of festivals, a couple of German shows, a show in Amsterdam and four shows in the UK; this is the second to last one. EVA: Regarding the audiences – US, UK and Europe, how do these three differ from each other from your point of view? DAVE: There are minor differences. I think there is a longer attention span in Europe than in the UK and US. Overall I think there is more of an appreciation for the arts in the UK and Europe as opposed to the States. But I have to say that I’ve had a good fortune to play to some good audiences in the States and people who were attentive and interested in the songs. There are just little differences but you can have those from the west coast to the east coast in the States too; so not too vastly different. EVA: You're about to go on tour with The Gaslight Anthem in Australia. Have you played there before? DAVE: I have, I played there solo - I opened for The Bouncing Souls and Hot Water Music at the end of 2010, right before Resolutions came out. I didn’t even have the record with me when I was there. So I went there solo once and then the summer prior, I was there with The Loved Ones. So I’ve been to Australia twice, but this will be the first time that I have a record out and Gaslight as well so the shows will be pretty busy, it will be fun. EVA: Are you excited to go on tour with the Gaslight guys again? DAVE: Oh yeah, we always have a blast and Australia is a fun place to tour, so I think we’ll have a good time. EVA: You’ve done many of the Revival Tour shows. What does this event mean to you and how has it influenced you as an artist? DAVE: Being a part of that tour is like a song writing class. You have to learn other people’s songs and figure out how they work, and a lot of times you don’t have a lot of preparation so you have to kind of use your instincts a lot. It’s a great thing to be on a tour that has different ideas and different approach to music. It’s been a big part of my life. I did week of it in 2009 without having a record out, then I did a big one in Europe two falls ago and I did the full one in the States this year. So I’ve done it quite a bit and I’ve learned a lot. It’s a great tour, a real learning experience and really fun. EVA: What are the ups and downs of performing as a solo musician opposite to being in a band or a group like the Revival Tour? DAVE: The Revival Tour is the best of both worlds, because you have a band that you can use but you don’t have to. I like touring solo, because it’s lot easier, there’s a lot less to worry about. It’s risky around stage but then again, when it works it’s really exciting. I do miss some of the camaraderie and the fun that you can have with your buddies, but I’ll bring a band out eventually. Next job I do a bunch of festivals, I’ll bring a band. But the idea to having to logistically deal with a band is less attractive to me than it used to be because I just load in, play and do whatever I want. Musically, the challenge is to keep it interesting with limited amounts of instruments, but it’s fun. I’ve been doing it for a little while now so it feels pretty good. EVA: You’ve finished recording a new album recently. Can you talk a bit about the recording and how does this record differ from Resolutions musically and lyrically? DAVE: It’s darker than Resolutions. The lyrics are a lot darker and it’s a little bit more of a themed record, it’s almost a concept record. It’s recorded in a much bigger sounding way, we did it in a really impressive studio in Hollywood where they made all kinds of famous records and we spent a lot of time on it, which is important. It’s a big step from Resolutions; that was more of a collection of songs that I had that started to make sense over time. This record was written almost like a book. It had a beginning, a middle and end, like I had it sequenced before we even started preproduction. I’m really proud of it, it’s the best piece of music I’ve made for sure and I’m excited for it to come out. EVA: Will you be touring back in the UK when it comes out? DAVE: Yeah, I’ll be back in November. I’ll come and do a full headline run through the UK and Europe, that’s about a month long. EVA: You’ve recorded some covers on your special 7” releases and you’re also known to play some covers live. How do you choose these? DAVE: They have to be good for the vibe and I have to be able to perform them. I just figure out the song I’d like to try, give it a couple of whirls and if it sounded pretty good at sound check, I’ll take the risk and if it works it works and if not, I’ll move on. I haven’t played a lot of covers from the 7” though, I don’t know why. Maybe because it’s 20 of them and I don’t know how to pick one. It was more of an exercise for me in the studio and I’m happy with them, they’ve turned out pretty cool. EVA: Where do you gather the inspiration from when you write songs? DAVE: Just everyday life, the people I know and their stories, the stuff you see on the news...You can pull something out of anything, that’s the trick. It’s not easy but if you keep your ears open and your eyes open you can usually find something to write about. Lot of it is just going through the maconations of actually writing, which I’m not that diligent with. It’s usually like a crunch time when I’m writing. EVA: Is there anybody you show/perform your new material to first? Who gives you the ‘first impression’ opinion? DAVE: That changes over the years. It depends on who you’re making the record with, who you’re hanging around with or who you’re on tour with, but I have a bunch of people that I’ve trusted with the material over time and bounced ideas off of them. That’s the cool thing about doing as much touring as I do, because you run into lots of people and then you form these pretty intense connections cause you’re in a van with them for two, four or six weeks and lot of them are super talented people that you can go back to if you have a song, so it’s like a nice sounding board. EVA: As a child, were you always surrounded by music? DAVE: Yeah, my folks were huge fans of music; my dad plays a guitar really well. They always encouraged us to play music, like sent me and my sister to piano lessons and when I wanted a guitar they were really supportive of it. My dad still plays a lot of music. EVA: Who inspired you to become a musician, was it him? DAVE: I guess in a roundabout way. There was this band in Philadelphia when I was about eight years old that was really popular. They were like a rock band and they were called The Hooters. I was at the right age to have it really blow me away. My uncle took me to see them and an eight year old at such a giant rock show; I have never heard anything that loud, so it kind of alters your perception pretty early. So that was a big part of it, and all my parent’s friends were into music so I kind of knew early what I wanted to do, it just took me a while to get to it. EVA: Do you have time to listen to any records while on the road? EVA: You used to be a roadie for bands like Kid Dynamite, the Bouncing Souls etc. Did that help you on the path to becoming a musician? DAVE: Yeah, you learn what to do, what not to do, you learn the tricks of the road and make lots of connections, so yeah it was definitely helpful. EVA: If you could share any words of wisdom for bands or musicians who are trying to make it in music nowadays, what would it be? DAVE: It’s a long process to get where you want to be and you have to make sure that the work is what the reward is. You’ll never be completely satisfied with the amount of people at the show no matter who you are. You need to be satisfied with the work you’re doing, the songs that you write and the performances you give. That’s the thing I learned. I fucked it up but I’ve also gotten it right too so it’s like anything else, you make mistakes in life and then you try to learn from it. Make sure you’re focused on the action, what you’re actually doing on the daily basis and that you’re enjoying that because that’s what your life’s work is. It’s not about how many people come, it’s not about whether or not you got that award ... and all those sorts of fleeting things. They’re part of it and they’re rewards but you really want the actual music that you’re playing to be the reward. Work when you’re home, work on song writing, work when you’re playing. I needed to take that same advice. Try to always be better.